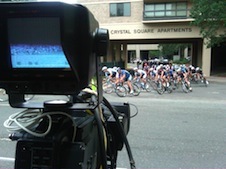 A roster of some of the most elite professional cyclists in the world competed Sunday, June 12 in Crystal City, Arlington, Va in The Air Force Cycling Classic. This was the second day of racing for Pro/Am teams competing in the Omnium competition. The 2 kilometer criterium circuit went along the city streets and around sharp turns. Speeds exceeded 25 miles per hour in a tight pack of bicycles. Six cameras provided total coverage of the course. Peter Roof operated one camera at the only 180 degree turn. Triax camera cable was strung for several blocks with some runs going over the streets. The live broadcast was seen on local cable channels and on the internet.